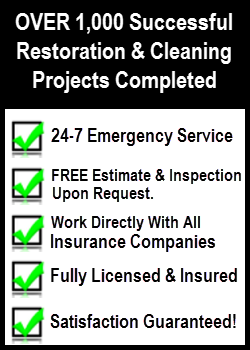 AllStates Restoration a New Jersey based water damage and disaster recovery company provides water damage restoration services for both residential and commercial. Our certified, trained technicians respond to emergency water damage in NJ 24-hours a day, 7 days a week to both homes and business. Estimates predict that just about 1,200 each day have various forms of water damage take place. Most water damage scenarios are within the ability for most people to handle the job themselves with slight know how. Do not sacrifice the insurance claim deductible and potentially have a policy rate hike? or even a cancellation notice forthcoming in the mail? Don’t let fear grip you upon seeing this disaster first hand! Nearly all water damage loss claims could have been handled by everyday people who are in satisfactory physical condition. You only need the understand how to proceed. This step by step basic guide informs you of how to go about doing this water damage cleanup by yourself. If the source of the water damage is actually a backed up sewer line or has had fresh water standing for a number of days after that you need to contact a professional water damage restoration service as this kind of remediation requires training and skills beyond the scope of this website info. Turn off the electricity: Find your main circuit breaker box and turn off the power to any rooms where the flooring is wet. Equipment Rental Outlets: Water damage drying equipment could be rented at most rental yards these days. Most equipment rental outlets contain professional dehumidifiers and carpet Fans that dry out structures/homes, while they help local restoration and carpet cleaning organizations meet varying demand. Household furniture Removal: Find a dry space to put furniture in. Use protective aluminum foil or plastic below legs if soaked before repositioning. Unhook the carpet from tack-strips: In case your carpet is soaked? and many square ft of rug is soaked the pad needs to be removed to dry this area. Remove excess water as well as dry the carpet: Use a wet/dry shop vac to remove excess water. Prop up the carpet: Prop up the carpet using saw horses to permit position of carpet blower to dry sub-flooring and carpet backing. Ensure daily plus rotate carpet blowers into other necessary positions. Use a dehumidifier for every room which is 12′ x 12′ in size in conjunction with the carpet Fan, face all carpet blowers with air flow in same direction. Wet Books and papers: Place papers and books which can be soaked right into a plastic freezer bag and freeze them to hold the ink from running. Discard the carpet pad: Empty into garbage cans for pick up or to the garbage dump you go. Remove the baseboards: Wet baseboards need to be removed as mold will grow behind them if not removed. Drill holes: Drill some 1” holes at the base of walls that seem wet. Well that about does it, you will have probably saved hundreds or thousands of dollars and also have reduced any chance of the insurance rates going up.